Urgency creates anxiety. Whenever a desired manifestation turns into an obsession, the natural vibrations of energy become disoriented. It is not necessary to cling to a thought in order for it to be. The simple fact of knowing that the universe is in control and working toward your goal will increase your manifestation outcome. 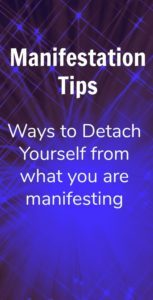 Easier said than done, here are some suggestions for detaching yourself from your desired manifestation. Let’s say that you are attempting to manifest a certain amount of money because your bills are all past due. You are already stressed over this situation and are making a last-ditch effort for results. It takes more than wishing for something for the law of manifestation to occur. False hope due to being in a corner is not a true belief in manifestation. Faith is something that many people are unable to grasp. To trust in something other than your own doing may seem like a fantasy. You must develop to a level of spirituality or oneness with the earth. Until this point is reached, there can be no hope of continuing on the path of manifestation. Taking an I-do-not-care attitude toward what you are hoping to achieve is almost like not starting the process at all. There has to be a heartfelt resonance in your inner soul to reinforce your belief of the universe. Taking the attitude that if this works, fine, if not, fine, is the same as not having any faith. Tell yourself that what you want may not be the best road to take. By making up your mind that no matter the outcome, the manifestation will be consistent with your request. Not every choice that we make in life is for our own good, but trusting in your higher power and the universe to show you the way will keep you from expecting specific outcomes. Remember, you are able to attract manifestation by detaching yourself from doubt, negativity, and impatience. Never wish bad actions on others. This is an unfounded negative request and is not acceptable in the spiritual realm. Once you see that first positive outcome, you will wonder why it was ever questioned. Just be and let be. The manifestation will arrive at just the right time. Have you read my book “My Intuitive Journey: Into a World of Energy, Spirituality, and Attraction”? You can find it here.